What is Passing Gear philanthropy? It is philanthropy that seeks to engage society’s inventiveness and focus its capabilities on situations where current performance is missing the mark. It cultivates the will, imagination, and know-how to enable caring and concerned people to address contradictions between the ideals we hold and the disappointing realities we confront daily. The report begins with data and analysis of how far the South has come, not just since 2007, but in the last 50 years, since the ground-breaking and tumultuous years when MDC was founded, change was underway, and hope seemed on the horizon. Using timely, disaggregated data on population, demographics, health, in-migration, poverty, assets, K-12 education, postsecondary attainment, and more, it outlines the progress made, and the challenges—old and new—that have yet to be solved. 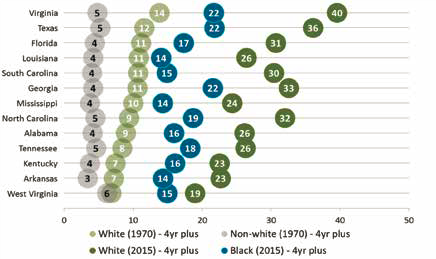 Just one example: while black and white attainment of Bachelor’s degrees have both increased markedly from 1970 to the present (when states ranged from about 6% to 14% of college graduates for whites and 3 to 5% for blacks), white degree attainment has increased more rapidly, ranging from 19 to 40%, while the number of African Americans with BAs increased to 14 to 22% among 13 states. Chapter 2 presents a framework for action by Southern philanthropy: a description of what Passing Gear philanthropy is, how a foundation must think differently to find inventive solutions to address “wicked problems,” and what it looks like in practice. It puts Passing Gear into the context of the four traditions of American philanthropy (Relief, Improvement, Social Reform, and Civic Discourse/Engagement), and explains the importance of using all five forms of philanthropic capital (Social, Moral, Intellectual, Reputational, as well as Financial)—a process that includes examining history and data, recognizing a philanthropy’s core values, then moving from concerns and ideals to focused work. This chapter also includes an analysis of 28,000 grants to Southern organizations from 2004-2014 identified as Passing Gear grantmaking by MDC, sorted by source—regional and non-Southern funders—and by geography and fields of interest.